Can strength training really help your running, cycling, swimming, skiing or rowing? The majority of endurance athletes accept the idea that strength training is beneficial for their sport, but some athletes, coaches and scientists remain unconvinced. On an anecdotal level, it does seem odd that the best endurance athletes in the world - the Kenyan runners - rarely report to the gym, and on a more scientific level it seems clear that training for endurance and training for strength and power are at opposite 'poles' of the conditioning spectrum. To run a marathon in two hours and eight minutes, for example, a runner's leg muscles need to develop the capacity to take about 23,000 rapid but submaximal steps without stopping, while training for strength often consists of hoisting a close-to maximal weight fairly slowly - and no more than 8-to-10 times before stopping. How could lifting a weight slowly for 8-to-10 reps, even if done for several sets, really prepare a runner's muscles to optimally handle the thousands of quick contractions needed to run a marathon - or even a 10K? That question is not easily answered, but exercise physiologists have certainly attempted to do so. A variety of different studies with endurance swimmers, skiers, rowers, cyclists, and runners have tried to determine what - if any - benefits are associated with strength training. We'll guide you on a painless 'trip' through the best of these investigations and tell you what they really mean to you and your training. We'll start with rowing, primarily because strength training is advocated by most respected rowing coaches and because strength - rather than pure endurance - seems to be such an important aspect of rowing competitions. Research studies have suggested that anaerobic energy production (the type of energy production associated with forceful muscular contractions rather than continuous submaximal ones) creates up to 23 percent of the energy needed for many rowing competitions. Strength training for rowers also has an interesting history. In the late 1960s, many serious rowers followed a program of high-resistance, low-repetition training during their pre-seasons and then gradually shifted over to low-resistance, high-repetition efforts during the competitive season. That was a reasonable approach. The idea was simply that the ultra-strength developed during those pre-season, high-resistance, close-to-maximal exertions could be converted to real power during the competitive season by shifting over to quicker, more explosive, submaximal movements. To put it another way, the pre-season was designed to build up brute muscle strength, while the in-season was supposed to develop the ability to apply all of that strength in a quick, coordinated way ... i.e. with great power. Strength: The strength of an athlete is determined by measuring how much 'work' he/she can perform. The work might involve lifting a 400-pound weight overhead; if two athletes can each lift 400 pounds - but no more than that - overhead, they are equally strong. If one can lift only 300 pounds, he is less strong. In endurance sports, the work involves transporting one's body (or one's body plus bike or boat) from one point to another. That's why we must say that the 150-pound marathoner who moves his body 26.2 miles in five hours is just as strong as the 2:08 elite marathoner of similar weight; the amount of time required to accomplish the work just doesn't matter when we are talking about strength. We would have to contend that the 200-pound marathoner who finishes the race in five hours is actually stronger than the 120-pound competitor who crosses the finish line in 2:08, since the heavier runner has done more total work. He has shown that he can move a much greater weight over the entire marathon distance, and we're not sure that the little 120-pound fella could do the same thing with an 80-pound weight attached to his body. Power: Power, though, is completely different: power is the amount of work performed per unit of time. Thus, the 150-pound marathoner who finishes in 2:08 is considerably more powerful than the 150-pounder who clocks five hours, since the denominator is considerably smaller in the first case (it's just 128 minutes versus 300 minutes), and therefore the quotient (the work performed per minute and the actual power in Watts) will be higher. As athletes develop the ability to generate more muscular force in shorter periods of time, they become more powerful. Although we tend not to think of endurance sports as power events, competitive endurance athletes are concerned about power, since higher power equates with faster race times. In contrast, devotees of training programs like the Galloway (run-walk) system are mainly concerned about strength, since their primary goal is merely to get their body weight across the finish line. Getting back to rowing ... strength training has evolved somewhat from the model we described above. Currently, it seems that more rowers are doing extensive amounts of low-resistance, high-repetition work during the pre-season and then shifting over to an emphasis on 'specific movements' (those that mimic the biomechanics of rowing) during the competitive season. Actual research concerning strength training for rowing hasn't exactly been exhaustive, with the best study probably being the one carried out by researchers at the University of Alberta and the University of Victoria in Canada in the late 1980s. A high-velocity (and low-resistance) strength training group. A low-velocity (and high-resistance) strength training group. A control group which carried out no strength training at all. The first two groups strength-trained four times a week, and each workout consisted of 'circuits' of 12 different exercises which worked the key muscles involved in rowing (two to three circuits were completed per training session). Within a circuit, each exercise was carried out continuously for two 20-second intervals (with a 20-second rest between intervals) before an individual moved on to a new exertion. The high-velocity, low-resistance trainers completed about 18-to-22 reps in 20 seconds, while the low-velocity, high-resistance athletes finished 6-to-8 closer-to-maximal repetitions during each 20-second period. After five weeks of such training, the high-velocity rowers improved their strength during high-velocity movements, while the low-velocity oarsmen improved their strength during low-speed motions (surprise, surprise!). However, high-velocity athletes were not stronger while doing low-velocity movements, and low-velocity ones were not stronger during high-velocity actions (again, surprise, surprise!). These results are in exact concordance with the critically important specificity of training principle, which basically says you get better at doing only those things which you specifically practice in training. To use a running example, training fast makes you a faster runner, while running loads of relatively slow miles makes you skilled in the fine art of running slowly. Unfortunately, actual rowing performances were not measured in this Canadian study. However, all 18 oarsmen did climb aboard rowing ergometers for tests which evaluated their lactate productions and power outputs during 15 seconds of maximal rowing and 90 seconds of full-tilt effort. These check-ups revealed a slight trend toward improved power outputs (and greater lactate production) in the high-velocity trainers after the five weeks of training, but the changes were not statistically significant. The low-velocity trainees also failed to hike power, and the control subjects actually lost power over the 5-week period. The lack of significant improvement in power output has been taken by many to mean that strength training is not really that important for rowing. The naysayers contend that the strengthening activities ordinarily carried out by rowers, even though they involve the same arm, shoulder and leg muscles involved in rowing, are not specific enough to rowing to make any difference. In other words, an athlete gains strength from the strengthening activities (one would certainly hope so! ), but this strength doesn't carry over from the simple moves utilized in the gym to the complex act of rowing. This conclusion is logical enough and does represent a strict interpretation of the important specificity of training principle, but it is also premature. We shouldn't forget that the Alberta-Victoria study went on for only five weeks; it's asking a lot of a strength program to expect it to produce statistically significant performance improvements in just 35 days! A more reasonable time frame for this study would have been at least 12 weeks. In addition, the strength programs utilized in this rowing research were totally lacking in sophistication. As we mentioned earlier in this article (optimal power development for endurance sports) depends on two key things - the development of greater strength and the evolution of quicker application of that strength. The low-velocity, high-resistance rowers were working on the greater-strength-development portion of the equation, while the high-velocity, low-resistance oarsmen worked solely on the quick-application end of the formula, so neither program was complete! The researchers, in addition to extending their study for a longer time period, should have added a third group of trainees who first went for the high-resistance routines and then graduated to low resistance with fast movement. We could call the first part of this overall scheme (the high-resistance part) the 'muscle' portion of power development, and we could call the last part (the quick-movement portion) the 'neural' piece of the puzzle. You need both to maximize your power! Your muscles supply the raw force, and your nerves supply the coordination of that force - and the rate at which it is applied. To illustrate this more clearly, take the case of a group of baseball pitchers who underwent some rather unique training. Instead of using only regular baseballs, they threw both heavier- and lighter-than-normal balls during their conditioning. Throwing the heavier balls strengthened their muscles appreciably, which was great, but it did have one drawback: actual arm motion was slower with heavier balls, compared to regular or light ones, and thus if the players had used only heavy balls in their training they would have been fine-tuning their nervous systems' abilities to coordinate strong - but slow - movements. That's why the light balls also had to be included in the training program; throwing lighter balls improved coordination during quicker-than-usual arm movements and taught the athletes' nervous systems to 'recruit' muscular activity quickly (faster movement was possible because the light balls offered less resistance). When these three elements - strength, coordination and quickness - were put together, the pitchers threw with much higher velocities compared to hurlers who trained only with regular balls (the difference in fastball speed was about 6-to-8 percent). But how does one periodize such training? Should the heavy work really come first (that is, after an appropriate 'base' period of general-strength building but before the high-velocity training), should one simply combine low- and high-velocity work together, or is it ideal to start with fast work and then add on strength? Surprisingly, these questions have been little researched, but investigations carried out in the former Soviet Union suggest that it is probably advisable to go through a preliminary period of heavy-duty (low-velocity) training, followed by the lighter, faster work. In baseball, for example, the idea would be to build basic shoulder strength before subjecting the shoulder joint and muscles to the high forces involved in whipping the arm forward at higher-than-usual speeds. One could put forth a similar argument for running, cycling, swimming, rowing and skiing. This question was looked at by the scientists from the University of Hawaii who carried out the baseball study. Their research involved 45 high school and 180 university baseball pitchers, who completed three workouts per week over a 10-week period. A control group utilized only a standard-weight (five-ounce) baseball. A second group trained with both a standard and heavy (six-ounce) baseball for five weeks, followed by five weeks with only a standard and light (four-ounce) ball. The final group worked out with standard, heavy and light balls simultaneously throughout the 10-week period. During a typical workout, the pitchers threw just 66 pitches. For the control group, each pitch was made with a standard ball. The group which simultaneously used standard, heavy and light balls would throw (in order) 11 times with the regular ball, 22 times with the heavy, 22 times with the light and then 11 times with the standard baseball during a single workout. The heavy-first-and-then-light group sandwiched 11 standard throws around 44 heavy throws during the 5-week 'heavy' period and 11 standard throws around 44 light ones during the final, 5-week 'light' period. After 10 weeks, the control group failed to improve pitching velocity, but the other two groups raised throwing speeds by a similar amount - 6-to-8 percent. This suggests that concurrent usage of high-resistance and low-resistance work is okay for power development, but whether this is also the case for more extensive training programs and for endurance athletes remains to be seen. As is the case with rowing, most serious swimmers conduct regular resistance workouts, believing that such efforts give them stronger strokes and greater propulsive force in the water. As we have suggested, however, this popular philosophy is not immune from criticism. For example, it's easy to see how high-quality strength workouts might produce enough muscular fatigue to lower the quality of regular swimming sessions (as it would for the other endurance sports, too). Reducing the quality of the actual work which is carried out in training is certainly not an optimal way to enhance performances. Another possible problem is that strength training can increase bulk (muscle mass) and therefore decrease movement, speed - the added weight tends to resist motion - and requires greater force production by the muscles to maintain usual training and racing speeds). And a final gripe is that if you coax muscle cells into getting involved in the process of making themselves stronger (by increasing the number of contractile proteins inside the cells and widening muscle-fiber diameters), they might 'forget' to do the key work necessary to heighten endurance, such as building more mitochondria and synthesizing exorbitant quantities of aerobic enzymes. 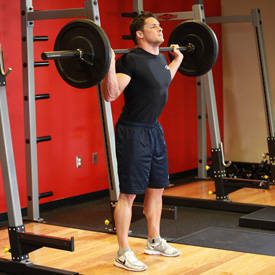 Overall, the idea is that hitting the gym for strength workouts makes it hard to fully develop one's endurance. That hypothesis has never actually been supported by scientific research, but the 'reverse idea' - that endurance training makes it hard to develop strength - does have reasonable scientific support. As mentioned, the overall notion is that simultaneously training for strength and endurance makes muscle cells a little 'schizophrenic'; they don't know how to behave because they don't know exactly what their 'master' wants. Classic research by R. C. Hickson and his crew (of researchers, not rowers) at the University of Illinois-Chicago has shown that endurance trainees seldom gain as much strength as pure strength trainers, even when both groups are doing the exact same strength workouts. Why does devoting oneself to endurance make it harder to develop strength? The energy demands of endurance training may 'rob' energy from the process of muscle-building, thwarting strength development, and of course the aerobic enzymes and structures (e.g. mitochondria) which muscle cells devote themselves to creating and increasing as a result of endurance training have little positive effect on strength. As a result, strength training can not be a maximally productive endeavor during times when endurance work is being heavily stressed. And even if adding strength training to endurance work did produce major increases in strength, the key muscle transformation which actually creates greater strength (i.e. larger-diameter muscle cells) shouldn't have a positive impact on endurance, say the skeptics, so why strength-train? The view is that when strength training is fitted into endurance training, the strength training is often fruitless, and even if it does work it won't help you run, cycle, swim, ski or row any faster. That's a stupid view, because strength serves as the prelude to power for endurance athletes, but it is true that scientific research has shown that swimmers usually become less strong when their swimming training intensifies just before key competitive periods. Nonetheless, they often perform well during competitions, making skeptics wonder why raw strength is so highly valued. Note that this is a weak criticism of strength training. The lack of strength which appears just before the competitive season - after a rugged period of training - results from the overtraining to which swimmers are usually subjected, which damages muscles and aggrandizes fatigue. The swimmers would probably perform much better if they lowered their swimming volume and carried out additional (or higher-quality) strength workouts to prevent such 'strength black-outs.' But, does scientific research really support the idea that strength training is good for swimmers? As with rowing, there is a relative paucity of relevant research. The most interesting study is one carried out by Hirofumi Tanaka, Dave Costill and Bill Fink several years ago at Ball State University, in which 24 collegiate swimmers were divided into two groups of equal ability. One of these groups combined strength training with their usual swim workouts, while the second group refrained from strength training altogether. All athletes participated in six swimming workouts per week, while the strength-plus-swimming athletes completed three resistance sessions each week, too. The swimming season lasted for 14 weeks. Total swimming volume started at about 2,000 meters per day, steadily rose to 6,000 meters per day by the end of the seventh week of training, stayed at 6,000 daily meters for a total of three weeks, and then dropped progressively over the final four weeks, reaching a low point of 2,000 meters per day during the 14th week, just before a major competition. The resistance-training group carried out its strength training on alternate days during the 4th-through-11th weeks of the overall program (for eight weeks total). No resistance training was completed during the final three weeks, and of course the resistance-free (control) swimmers carried out no strength training at all during the 14-week period. Note: Three sets of 8-12 reps of each exercise were performed per workout, and resistance was progressively increased over the 8-week period (the average increase in resistance was 31 percent). At the end of the season, both groups had improved their strength by the same amount on a 'swim bench'. Both groups improved their power during 'tethered swimming' to the same extent, and both collections of swimmers reduced blood-lactate levels during high-speed, 365-meter swims by the same amount. However, distance moved per stroke (during front-crawl swimming) was unchanged for both the strength-trained and regularly trained swimmers. Such drop-offs in velocity (power) are one reason why venerable exercise physiologist Dave Costill (one of the Ball State researchers) began telling swim coaches that they were forcing their athletes to swim far too many meters per week during training (i.e. the training volume was turned up way too high, causing overtraining and a lack of power). Unfortunately, actual competitive performances of the two groups of athletes in the Costill-Tanaka-Fink investigation were not compared, so the 'bottom line' in this piece of research was simply that strength training did not improve either swimming capacity or overall strength (measured while swimming) in these collegiate swimmers any more than did routine swim workouts. Many observers of the competitive swimming scene have looked at this key study and declared that it shows that strength training has little value for serious swimmers. Of course, the key problem with this assertion is that the strength-training program devised by Fink, Costill and Tanaka does not represent strength training in total; there are many other types of strength schemes which swimmers could follow. In fact, the overall strength program was a poor one. The key principle of progression was utilized in only one sense in Tanaka's plan: the swimmers did progress from lesser to greater resistance over the 8-week period. However, there was no progression from one type of strength training to another, e.g. from general strengthening exertions to those more specific to the act of swimming, and in fact the exercises utilized by Tanaka's athletes resembled the actions required for swimming only in the sense that the major muscles needed for swimming were stressed during the strength training. The exact (or nearly exact) movements required for swimming were not replicated during the strength training, and thus the neural (coordination) component of strengthening was absent. Movement speed was also not varied; the swimmers lifted weights at roughly the same speed throughout the whole 8-week period (there was no alternation of high-resistance, slow-velocity efforts with low-resistance, and high-velocity ones). It's easy to see why Tanaka's program made the swimmers stronger while doing the specific exercises in the program - but not while swimming. The research would have been much more interesting if the swimmers had tried some quality strength training. Can strength training help cross country skiers? Heikki Rusko and his colleagues at the University of Jyvaskyla in Finland checked out that possibility with a unique piece of research carried out in the late 1980s. Rusko's subjects were 15 national-level cross country skiers, seven of whom took part in a unique, 6-week strength-training program which combined both explosive (high-velocity, low-resistance) exertions and heavy-duty (low-velocity, high-resistance) work. The explosive exertions consisted of sprint training, jumps and other quickly-conducted exercises, while the heavy-duty stuff involved squats with barbells and other basic resistance exercises using loads of 70-to-90 percent of an athlete's 'one-repetition-max,' 70-to-90 percent of the greatest weight which an athlete could lift once. Meanwhile, a control group of eight skiers spent most of their time engaged in routine endurance training for skiing but also completed some 'endurance strength training,' which consisted of very-low-resistance abdominal, arm and leg exercises with hundreds of repetitions. After the 6-week training period, the explosively trained group held a couple of advantages over the endurance group. First, the time required to develop significant muscular force, which was initially equal between groups, shortened in the explosive group, compared to the endurance group. Specifically, it took 0.41 seconds for the athletes' quadriceps muscles to produce 90 percent of their maximal strength before the explosive training was carried out - but just 0.29 seconds after the extensive explosive training (a 29-percent improvement). Meanwhile, the endurance athletes were unable to improve their quickness of force production in their quads. That was no surprise, since the explosive group emphasized quick, forceful movements in its training, while the endurance skiers moved more lethargically during their workouts. Basically, members of the explosive group improved the quickness with which their nervous systems stimulated their muscles to act. They became more powerful! Similarly, the explosive group improved their vertical jumping ability by about 11 percent over the course of six weeks, while the endurance group failed to jump any higher than before. As was the case with the upgraded rate of force development, this was not a huge surprise. The explosive athletes had been practicing their jumps, and jumping capacity depends on one's ability to accelerate rapidly away from the ground in order to overcome the downward acceleration produced by gravity. Acceleration is dependent on power, and the explosive athletes worked intently on power, while the endurance people had emphasized endurance and strength. As with the rowing and swimming research, no actual performance tests were carried out with the athletes, an omission which seems rather puzzling. However, all athletes were tested for changes in V02 max, aerobic threshold (the exercise intensity which caused blood-lactate levels to rise above 2 mmol/liter), and lactate threshold, and it was determined that neither the explosive nor endurance athletes improved in those key areas. Because of that, various individuals contend that Rusko's research constitutes "proof" that strength training is of little benefit to cross-country skiers (the cross-country skiers could jump higher than usual after Rusko put them through their paces, but shrewd skeptics pointed out that there is little link between vertical jumping ability and cross-country skiing performance). However, it's premature to say that strength training can't lift endurance-skiing capacity, since there were a number of problems with Rusko's research (in addition to the failure to test actual skiing performance). The total time devoted to strength training was short (six weeks), and the strength training, although it did include both low- and high-velocity work, failed to progress from general strengthening to exertions which closely paralleled the actual movements involved in skiing. Rusko's study only shows that a fairly limited strength-training program has little impact on maximal aerobic capacity and lactate threshold in cross-country skiers. Research exploring the effects of strength training on cycling has been a 'mixed bag'. We have the study carried out by Ben Hurley and his co-workers at the University of Maryland, in which 10 healthy men took up strength training (bench presses, knee extensions, knee flexions, press-ups, leg presses, lat pulldowns, arm curls, parallel squats and bent-knee sit-ups) for 12 weeks, while eight other healthy men served as controls. After 12 weeks, the strength-trained men improved their endurance while cycling at an intensity of 75 percent V02 max by 33 percent and also lifted lactate threshold (the single best predictor of endurance performance) by 12 percent. However, these men were untrained prior to the study and did not carry out regular cycling workouts during the research, so the applicability of these findings to serious athletes is questionable. The study carried out by R. C. Hickson and his colleagues at the University of Illinois at Chicago was considerably more practical. In that investigation, eight experienced cyclists added three days per week of strength training to their regular endurance routines over a 10-week period. The strength training was incredibly simple, focusing on parallel squats (five sets of five reps per workout), knee extensions (three sets of five reps), knee flexions (3 x 5), and calf raises (3 x 25), all with fairly heavy resistance. The only progression utilized in the program involved the amount of resistance, which increased steadily as strength improved. Nonetheless, the strength training had a profoundly positive impact on cycling performance. After 10 weeks, the cyclists improved their 'short-term endurance' (their ability to continue working at a high intensity) by about 11 percent, and they also expanded the amount of time they could pedal at an intensity of 80% V02 max from 71-to-85 minutes, about a 20-percent upgrade. However, a different study showed that strength training could also have a profoundly negative effect on cycling performance. In that piece of research, carried out by James Home and his colleagues at the University of Cape Town in South Africa, seven endurance cyclists who averaged about 200 kilometers of cycling per week incorporated three strength training sessions into their normal routine. The strength program was relatively unsophisticated, consisting of three sets of up to eight repetitions of hamstring curls, leg presses and quadriceps extensions using fairly heavy resistance. After six weeks, the strength training produced rather impressive gains in strength (the gains averaged a bit more than 20 percent). However, actual cycling performances were not improved; in fact, they were worse than before the strength training was undertaken! 40-K race times slowed from 59-to-62 minutes, and the strength-trained cyclists complained of feeling 'heavy' and tired during their workouts - and even reduced their volume of endurance training because of the excessive fatigue. Why did Hickson's study uncover clear advantages associated with strength training for cyclists, while Home's work revealed the reverse? No one knows for certain, which means it's time for a personal observation. It seems likely that the strength training carried out by Hickson's charges improved fatigue resistance in their muscles, permitting them to persist longer both during high-intensity tests of endurance and prolonged efforts at a submaximal (80% V02max) intensity. Meanwhile, it's likely that Home's added strength training sent his athletes into the overtrained - or at least 'stale' - state. The feelings of fatigue which originated shortly after the beginning of strength training suggests that the athletes were simply doing too much work. Home's cyclists averaged 124 miles of weekly riding when they started their strength training, while Hickson's athletes were logging considerably fewer miles, so one might be tempted to suggest that strength training can produce major benefits for low-mileage cyclists but does much less for experienced, higher-mileage competitors who have already built up considerable strength merely by riding. That certainly wouldn't be an unreasonable thought, but it doesn't explain why strength training per se would actually slow down endurance performances, as it seemed to do for Home's performers (no other study has shown this). It seems likely that Home's added strength training was simply the straw that broke the camel's back; it wasn't the strength training which slowed the cyclists but the total amount of work they had to complete. Although the strength-training research carried out with endurance rowers, swimmers, skiers and cyclists tends to produce 'negative' results, the same cannot be said for the studies completed with runners. Several different studies indicate that strength training can have a positive impact on running performances - or on the physiological variables which determine running performances. 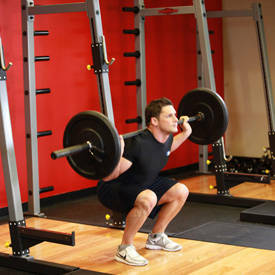 First of all, Hickson found that the strength program described above for experienced cyclists (parallel squats, knee extensions, knee flexions and calf raises with fairly heavy resistance) also improved the running performances of fairly experienced runners by about 13 percent (the high-quality running tests used by Hickson lasted about six minutes, so they were roughly comparable to 2K races). In a separate study carried out by Hickson, nine men took part in a strength program comprised of parallel squats, knee flexions, knee extensions, leg presses, calf raises, dead lifts, and sit-ups - carried out five times per week for 10 weeks. At the end of this 10-week period, endurance while running at an intensity of 100% V02max soared by 12 percent, indicating that the strength training had had a strong positive effect on running capacity. Interestingly enough, cycling performances also improved: after 10 weeks the men could cycle 47 percent longer at their cycling V02 max, and their actual cycling V02 max was 4 percent higher than before. Unfortunately, this study has little applicability to the training of most runners (and cyclists), because the men had not been training regularly for at least six months before the strength training began, and they actually completed no running or cycling training during the 10-week study period. The only conclusion one can reasonably draw from this research is that strength training improves the cycling and running performances of non-runners and non-cyclists! Actually, even that conclusion is not sacrosanct, since any type of continuous activity (including rowing, swimming, skiing and perhaps tiddly-winks) might have helped the men perform better during tests of endurance. However, a high-quality investigation carried out at the University of New Hampshire found that strength training had a statistically significant, positive effect on running economy, one of the key physiological variables which determines running performances. This study involved 12 experienced female runners; half of them carried out their regular endurance training over a 10-week period, while the other half completed the same routine endurance training but also added three strength-training workouts per week. The strength-training program, although incomplete, was slightly more sophisticated than the ones we have described so far. The female runners basically carried out two different strength workouts, alternating them from session to session. The progression utilized in the study was in the amount of actual resistance, which increased slowly but steadily as the runners became stronger. After 10 weeks, upper-body strength increased by an average of 24 percent and lower-body strength advanced by 34 percent. However, the most important improvement - from a running standpoint - was the 4-percent enhancement of economy which the strength trainers achieved (economy remained unchanged in the endurance group). Such a change should upgrade running performances by about 3 to 4 percent (indeed, the strength-trained runners tended to report greater improvements in their race times, compared to the endurance runners). The nice amelioration of economy as a result of strength training was not a big shock: exercise physiologists speculated for years that strength training might represent a great way to boost economy (the New Hampshire study was the first to actually test this hypothesis). What was a little surprising was that such a big gain in economy (4 percent may sound small, but it corresponds with a 100-second improvement in 10K time for the 41:39 10K runner, enough to break through the sometimes elusive 40-minute time barrier for the event) could be achieved with a program which was only moderately sophisticated. Many of the exercises utilized in the New Hampshire training program were best suited for developing general - rather than running-specific - strength (one might say that only the squats, knee flexions, knee extensions, lunges and bent-leg heel raises (5-of-14 total exercises) bore some resemblance to the biomechanical movements required for running). If there had been a real progression in this training program, moving from a strong diet of general strengthening exercises to a hefty platter of running-specific moves (lunges, high-bench step-ups, one-leg squats, just to name a few), it's likely that the improvement in economy (and performance) would have been even greater. If the strength training had been capped by a serious 'block' of hill training, the gains in economy would surely have reached 8 to 10 percent (hill training itself, when properly conducted, is known to enhance economy by at least 4 percent). And if there had been progression from the slow-speed, high-resistance movements (the basic exercises described above, plus even-hill running, which often takes place at less than race pace because of the slowing effect of steep inclines) to high-speed activity (lightning hops and bounds, quicksilver reps on the track), the gains in power- and performance - could have been truly maximal. Strength-train to reduce your risk of injury, and above all strength-train to heighten your level of performance. But don't rely solely on those classical, familiar exercises for the legs and upper body which almost all runners carry out. Those exertions aren't bad for building general strength, but you need to progress to running-specific movements and hill training, too. Progression doesn't mean just adding more plates to the weight stack; it also means making your routine more and more like what you do when you run. Progression also means varying your resistances and speeds of movement, both during your general and specific strengthening. You need the high resistance (and therefore usually slower speed) to optimally build strength, but you also need the low resistance (and therefore higher speed) to improve nervous-system control of what you are doing when you are moving fast, to enhance your rate of muscular force production - and therefore to increase your power. Yes, power, because even if you only run marathons, you are still engaged in a power sport. For runners, power usually means longer stride lengths, and merely expanding stride length by one inch 'shortens' the marathon by about 1 kilometer for the average individual, allowing a runner to cover 42K with the same number of steps which originally chewed up only 41K of 'real estate'. This 1,000-meter improvement would trim an average of 3-to-6 minutes from marathon finishing time, depending on ability level. The name "marathon" comes from the legend of Pheidippides, a Greek soldier who, according to legend, ran from the town of Marathon to Athens to announce that the Persians had been defeated in the Battle of Marathon, and died shortly after. There is no evidence that any such event took place: according to the Greek historian Herodotus, Pheidippides in fact ran from Athens to Sparta. In a similar vein, developing enough power to shear just two milliseconds (two thousandths of a second) from average foot strike time would carve 46 seconds from the elite runner's marathon time - and nearly a minute and a half from the slower runner's performance. Add those kinds of improvements to the ones accruing solely from upgrades in V02 max, economy and lactate threshold, and you will truly be able to run your absolute-best races. The process of strength training can be complicated, but we'll take all the guesswork out of resistance work in forthcoming issues of Peak Performance, showing you exactly what to do to become a more powerful endurance athlete.